Friends and sweet readers, I’ll ask in advance for your forgiveness on the length of this post. After 30 days of juicing, several hours of support and conversation with my Cleanse Coach, and a pretty astounding change in all areas “Joyce’s Health,” I have a lot to spill! After 30 days of cleansing- two weeks of nothing but fresh pressed goodness from The Weekly Juicery and another 16 days of 2 juices daily, a liquid meal and a healthy, solid option, I feel like I’ve finally found my happy balance, and I’ve undergone so many changes, physically and otherwise! I’m down 15 pounds since January 2nd, my skin has never looked better, and- the biggest change- I have almost zero cravings for sugar! I finally sat down with The Weekly Juicery’s Cleanse Coach (and my new best friend), Chris Kent to talk about the power of green foods, ideas of “cheating,” and the dramatic change he made in his lifestyle. At age 27, Chris was tired. He found himself sleeping 20 hours a day if possible, and even then, found it hard to focus, staying dizzy and off-balance. No General Practitioner could find a thing wrong with him, aside from being overweight. Finally, at age 30, he decided to check in with an alternative medicine specialist, who recommended strength training and balance exercises for the neurological issues he was experiencing, but told him that all of that effort would be moot if he didn’t change the way he was eating. “In the beginning, there was a lot of strength training and incorporating healthier food- upgrading to organic, and making sure I had food with me throughout the day.” Working as a teacher, and music and choir instructor, his options throughout the day were school cafeteria food, fast food, and what could be found in vending machines. He found that planning, and having real food and healthy snacks on hand was key. Chris found himself on the receiving end of customer questions regarding the cleanses that were offered. Not wanting to lead blindly, he chose to experience a 1-day cleanse for himself, then a 3-day…. Then 10 days on nothing except pure, good vegetable juice. According to Chris, “juicing focuses on digestive rest: After years of living on the Standard American Diet of flour, refined sugars, our bodies cannot pull the nutrition it so badly needs from what good food we do consume.” Gradually, he began to feel healthy again, and is now a walking example of someone who loves and cares for their body. How does one know what their body wants? I can attest that- after the last month- you just do. This girl- the one who always wanted a donut and a giant scoop of something from Comfy Cow more than anything has been craving beet juice, spaghetti squash, a little spoon of yogurt with pomegranate seeds. There are still moments I want a donut, but now, it’s easier to focus on a healthier option- perhaps a single macaron, or a slice of Ezekiel bread with a dribble of local honey. I really do attribute that to breaking my bad food habits for a solid 30 days. I’ve been asked by a few folks for what my experience was like with my cleanse and- lucky for you- I’ve kept track of my eating habits, weirdness, and cravings throughout! You can find a daily rundown below. The Weekly Juicery offers so many options as far as juice, smoothies, and superfood bowls, but I found that my favorites over the last month were Orange You Happy (a juice of orange, green apple, romaine, beet, lemon, ginger, and lime) and Bluegrass Sunrise (a juice of cucumber, green apple, grapefruit, celery, kale, lemon, and lime). While it was a must every day of my cleanse, the Lively Lemon (alkaline water, lemon and cayenne) was too much for me- after day 10 or so, I could go without ever seeing a lemon again, but I trucked through! I’m planning on incorporating cleanses into my life on a regular basis, running Chris’s recommendation of a 3-day cleanse with each quarterly change of season, and a 10-day stretch during the summer. After allowed meals of a little more sugar/fat/alcohol, I’m happy to take in a 1-day. I know that- no matter what- I’m a juice convert. 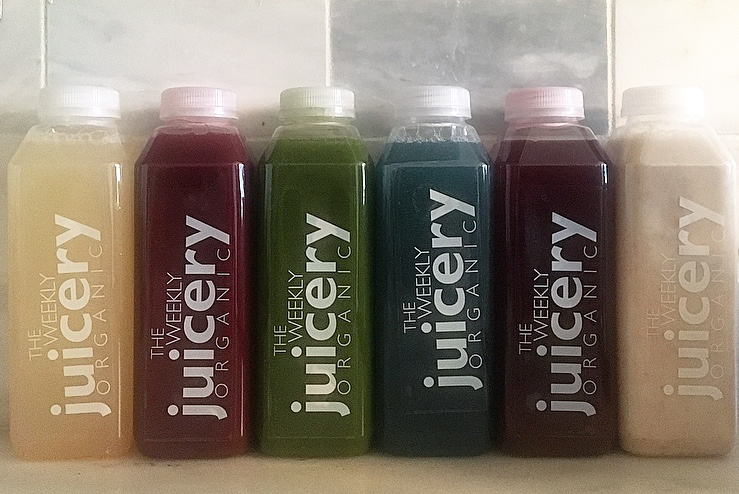 I’ll be a subscriber to the Juicery’s delivery program (check it out here) for as long as I can breathe and drink. This weekend, as an allowed reward to myself, the man and I are headed to Indianapolis. After so many veggies and liquid meals in my life, I want a sizzling, almost-still-mooing steak, preceded with the spiciest shrimp cocktail in the world. St. Elmo’s is calling my name, and so is a 1-day cleanse, come Monday. Day 1- I’m not hungry at all, which I find weird. I’m actually pretty full, and was curious about the flavors I’d be drinking. Not a huge fan of almost-all lemon juice though! Day 2- Was a little shaky all day and kept running hot and cold. Laid down at 6:30 on the couch, got up and went to the bed to “nap” at 7, and didn’t wake up until the next morning. Slept through my 5:40 alarm. Day 4- MASSIVE headache all day, and it was hard to get through Pilates. Day 5- Back to normal, lots of energy, have received 2 separate compliments on my skin, so that’s a new thing. Day 10- Cleaned the kitchen after Bryan meal prepped last night and realized how much I just LOVE the smell of bacon. Day 12- Bryan ordered Domino’s at 10pm- thin crust pepperoni with light sauce. I had a couple bites that took several minutes to eat. Tasty, but not what I would have chosen- I’ve been craving game-y foods in the last couple of days, like veal, steaks, etc. The meatballs at Carmine’s in Chicago sound SO GOOD right now. Day 13- finished at the gym and walked through Whole Foods for the man to buy himself dinner. Got home and chugged a green juice, and OH MY GOD, I’M SO HUNGRY. Day 15- I made coconut chia pudding last night and topped with a few blackberries and pomegranate seeds this morning. Chicken broth with noodles at dinner followed by a small scoop of greek yogurt with pomegranate seeds. 2 juices. Day 16- 3 juices, quinoa and butternut squash for lunch, broth with noodles for dinner followed by the greek yogurt/pomegranate seeds again (this may be a new favorite sweet treat). Day 18- I was good all day- Nothing but green juice until I went to Speed After Hours, where they were serving Pho. I ate some of the noodles, and the broth, and afterwards, went to Rye with my friends to meet up with Bryan. There were Brussels sprouts on the menu, and I would have been happy with water, but couldn’t resist the Ricotta gnocchi with pork bolognese and a whiskey sour. I ate about half of the dish before feeling full, and was proud that I only had a singular bite of Bryan’s butterscotch creme brule. At 6am, I woke up with such terrible stomach cramps I thought I was dying. After a long time in the bathroom, and losing my dinner, I went back to bed knowing that I went overboard. Day 22- Checked the scale this morning, and still moving downwards. My first day lifting again. It’s funny how our bodies remember things. I used to be the only girl deadlifting- I had a huge back, and was super lean (I was also in my early 20’s, but that’s not the point). After my first set of lat pull downs, I literally felt the whoosh! of endorphins, and it’s like my muscles woke up and screamed, “YES!! We remember this!” I was famished afterwards, but still stuck to my eating regime, finishing half of a half of roasted spaghetti squash with spinach and garlic (recipe here. Omit the cream cheese and go light on the mozzarella). Day 23- Company awards were this morning, with a gorgeous brunch buffet. I stuck to a salad, and a few bites of scrambled egg, but did have my first cup of coffee this year. Heaven! Day 25- I made dinner tonight. Chicken with a sun-dried tomato cream sauce over zucchini noodles (recipe here). The man just loved it and asked that we incorporate more veggie noodles into our life. I did have a little less than a glass of an Argentinian red. So good! I made a point to dress the dinner table, light candles, and put phones away. Treating a healthy “normal” dinner like a special occasion felt nice…. It may have to become a weekend thing. Day 27- Brunch: A veggie hash made with Brussels sprouts, potato, thyme, garlic and shallots. I added bacon, and topped with poached eggs, instead of baking them right in (recipe here). Absolutely delicious. Day 28- Made chicken and dumplings tonight for a friend recovering from surgery… I was VERY proud I didn’t eat the raw dumplings. Yes, that’s a thing I used to do. My schedule today was hectic and forced me to miss a meal. I ended up having Cheerios with blueberries for dinner. Not my proudest moment. Today was, however, a lifting day, and I hopped on the treadmill for half an hour. Day 29- I must use all the Brussels sprouts before they go bad! I roasted them, and found a link of chicken sausage in the fridge that I broiled up. Day 30- Here we are!! Juice this morning, I can’t remember lunch even though it was 8 hours ago, another juice after my workout, and cauliflower fried “rice” for dinner.